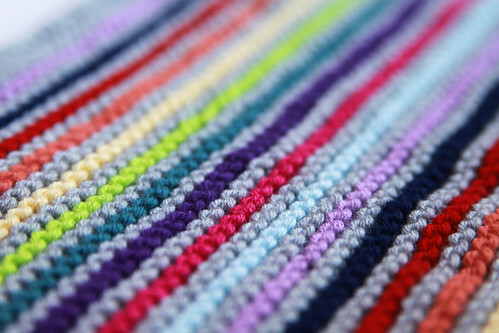 22nd October - stripy knitting, a photo by *superhoop* on Flickr. Another knitting themed photo from me tonight just because I appear to be knitting mad at the moment. I've got two projects on the got at the moment - the big blanket and now a toy for my daughter - and am just sad there aren't more free hours in the day I can dedicate to them. I love this photo because it just sums up what I'm like. I love buying lots of different coloured yarns and can never wait to start on the next colour. Perhaps I should make something stripy like this with lots and lots of colours in it. The focus on this is great and I can almost feel what this wool feels like. The photographer has managed to capture so much detail in something I didn't realise was so detailed.